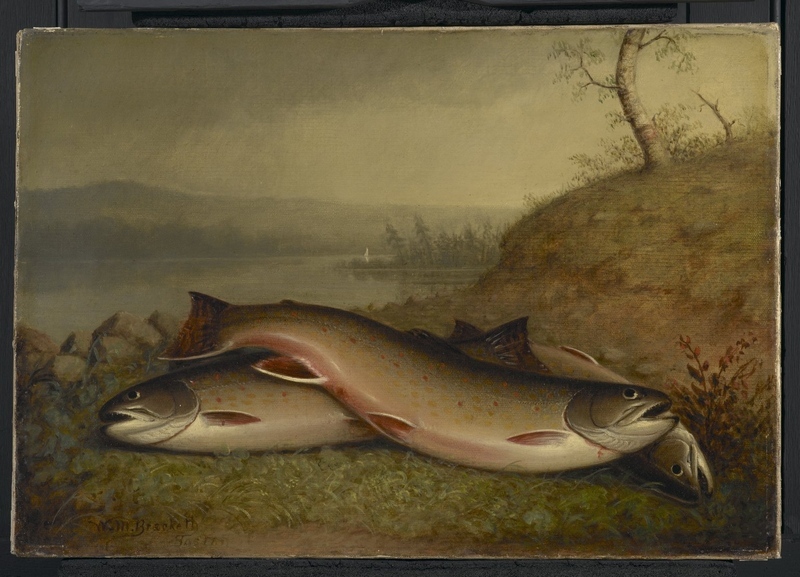 The Boston painter Walter M. Brackett also was an avid fisherman, here shown via an 1867 work simply titled "Trout." His skills and enthusiasm were such that he was selected to repaint the "Sacred Cod" sculpture hanging in Massachusett's State House. He was not afraid to offer a tart opinion, and enters this exhibit as an opponent to Seth Green regarding fishing technique. By the time Seth Green began operating his fish hatchery at Caledonia, in 1864, he was 46 years old. Already a local legend for his angling prowess—in the waterways and at fly-casting competitions—it was only during the last twenty years of his life that he received (inter-)national recognition. And he certainly made the most of that opportunity. Described by his friend Robert B. Roosevelt as “an original, with great force of character...the sportsman from head to foot,” Green cultivated a celebrity without which his conservation agenda probably would not have succeeded. As John Muir was to America's forests, “Uncle Seth” was to its waters. One way to think about Green's persona is through the traditions of Southwest Humor beginning in the 1830s, where self-made men like Davy Crockett and Mike Fink “were figures of admiration if not emulation; their verbal dexterity and boasting, their strength and skill in hunting and fighting, and their quick witted responses made them heroes and to some degree elemental forces of the American wilderness” (Molinaro). By the 1870s Green was more polished than these often violent archetypes, but while renowned for his piscicultural knowledge he seemed to enjoy mixing it up in the press with a zest that would have done credit to his contemporary Mark Twain. Suppose I had a salmon rod and three hundred feet of line with a good sized needle hook, all in good order; and suppose I was skillful, knew how to reel in and let out, and keep a steady strain, such as a skillful angler knows how to keep, and I had that hook hooked into the button-hole of Mr. Brackett’s coat; could he get away without putting his hands to the line or the hook? No; he could not get away. He might jump, and run, and rare, and pitch, and flounder, turn somersets, and hand springs, and turn himself inside out, or lie and sulk, but he could not get away, and I would land him without a gaff. To which the editor of Forest and Stream added, with undisguised admiration at this display of trash-talking: “When Uncle Seth handles a fish, he plays to win.” What can we take away from this episode? If nothing else, Green seems to have been very attuned to his profile—the ancestor to a thousand television fishing shows. Yet he seems to have been less interested in exploiting “Uncle Seth” for personal gain than for his larger cause. Perhaps he judged that we have trouble grasping ecology in all of its complexities, and depend upon an engaging protagonist. --Brackett, Walter M. “More Needle Points—‘Sharps.’” Forest and Stream 5.23 (13 Jan. 1876): 363. --Green, Seth. “Those Needle Points.” Forest and Stream 6.1 (10 Feb. 1876): 22. --Molinaro, John. “Southwest Humor and the Character of Americans.” Democracy in America. Xroads. 1997.